← Monday Question – What Are Your Fragrant Resolutions For 2013? The Quadrige Limited Edition bottle design. Hermès has been my daily companion for the past two months, nothing but JCE’s translucent beauty could get my attention. But all of a sudden, I felt the need to branch out a little, I was ready for opulence, and who is better versed in opulence (okay, aside from everything Amouage) than Maurice Roucel, who is not known for his restraint and translucency, but for solid and symphonic scents, of which 24 Faubourg is a perfect example. But! But I did not rush out to bring home this perfume because all of a sudden I felt the need for more, but – confession coming – because I saw that bottle, that beautiful bottle. I friend recently wrote to me that he looks for aesthetics and beauty first and foremost in everything and he thinks I do too. This was a kind of absolution for me. A permit that this is okay. My parents have no interest in beauty, aesthetics just do not feature in their lives, in their philosophies and they have neither understanding nor patience for it, so all my life I carried a lot of guilt for wanting, needing, craving that quality. Slowly, slowly I have started to unload that unnecessary guilt, and this blog, the intense confrontation with perfume, have helped enormously. So I saw this bottle on Bois de Jasmin and knew I wanted it for its beauty alone. That it holds an exquisite scent is only the cherry on top and something that makes me happy, but unexpectedly so, because all I knew about 24 Faubourg before I laid hands on my precious Quadrige Edition was from one spray on the back of my hand right there in the store. The most important thing about 24 Faubourg was and still is, that it sparked my passion about perfume back into life. After a two-month stint of fragrant hibernation in a cloud of L’Ambre des Merveilles, I went crazy for something else again, even if it was only a bottle (at first). 24 Faubourg was created by Maurice Roucel in 1995 and includes notes of orange blossom, jasmine, tiara flower, ylang ylang, iris, patchouli, vanilla, ambergris, and sandalwood. It is available as Eau de Toilette and Eau de Parfum in both 50 and 100ml. 24 Faubourg is more than a pretty bottle, obviously. It is a terrific perfume and it fits the image of the house of Hermès excellently. It comes from the pre-Ellena phase of more expansive perfumes and it is a necessary and valuable addition to the rest of the house’s offerings. 24 Faubourg is a full-bodied, honeyed orange blossom and ylang floral resting on an amber-coated patchouli and sandalwood bed. It smells warm, sun-drenched, rich and sensuous. It smells classic, perfume-y and elegant. It smells mature in a way that is not old, but grown-up enough for a wearer who knows a good bit about life and its vagaries, and is still young enough at heart to be able to laugh about it. The woman wearing 24 Faubourg loves and appreciates beauty, she seeks it out and finally, finally knows that there is nothing shameful about that. This entry was posted in Amber, Chypre, Floral, Fragrance Reviews, Hermès, Orange Blossom, Patchouli, Ylang Ylang and tagged Amber, Faubourg, floral, Fragrance, Hermes, Maurice Roucel, Orange Blossom, Perfume, Review. Bookmark the permalink. Beautiful. I have loved this perfume for years and have used up several bottles before falling down the rabbit hole. Now you have shown me a gorgeous bottle with a lovely perfume. Aaaah- yes, to love beauty is quite alright. Thank you. Thank you for re-enforcing that fact – loving beauty is quite alright. 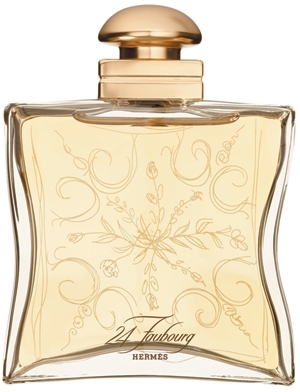 I didn’t know 24 Faubourg was one of your pre-Perfumista scents, now I like it even more! One of my all-time favorite perfumes. A magnificent study in elegance and sophistication. I think my first comment on your blog was, in fact, about 24 Faubourg. LOL. My apologies for my verbose philosophical ramblings. It’s 2 a.m. here. I am just happy you got such a wonderful and truly *beautiful* scent. What you are saying is very true, and wit my parents, it is probably more about acknowledging the fact that beauty is a necessary part of our lives and naming it as such, rather than it just not being relevant. Speaking of old-style Hermès scents, have you ever smelled Parfum d’Hermes? Not the reformulated version sold as Rouge d’Hermes or even what is currently on the Hermes website, but the original one in the donut shape? It’s an interesting example of just how far the Hermès line has changed. It was/is a very elegant, slightly aldehyde-heavy chypre oriental. Very classique and old-school, and it used to be another one of my favorites from the Hermès line, though its very dated now and bit too powdery for the current me. I sometimes bring out my bottle, then compare to more recent Hermes perfumes, and it’s like night and day. You’d never think Hermes had put it out; it seems more like a Dominique Ropion Ysatis relation from Givenchy! Anyway, 24 Faubourg seems to have been right in the middle of that sweeping shift and is a far more enduring, current smell. Unfortunately I can’t comment on possible reformulations of 24 Faubourg in recent years. I’m Polish too, living in UK for over 5 years, and I know exactly what Behemot is talking about. We didn’t have tradition of scenting ourselves with pricey products like perfumes because they were extremely expensive for people in our country, second they were not easily available these days. No one could possibly spend entire salary or more on just a bottle of fragrance. There are still many people that don’t even look at top fragrances as it’s too much for them. Things have been getting better for those who live in big cities, but it is also true that some would feel guilty spending on such an “unnecessary ” stuff like perfume. Catholic bringing and modesty have a lot to do with it but I know that whenever you struggle to make both ends meet it’s quite hard to think of pleasures that cost you a lot, whether this is perfume, clothes, home decoration or any form of art you want to experience. So i just keep my fingers crossed for people to have as much beauty as they’re able to find and enjoy. Such mindsets are sitting so deeply in us. It’s liberating to get over it. Oh yes. It is truly liberating. Too bad it took so long, at least in my case..
Oh my, I don’t know 24 Fabourg, its notes though scared me to death! But the bottle is truly pretty, B. Interesting point, B, the guilt about the beautiful bottle. I sympathize with that as I always found it was all about the fragrance and did not take notice of the bottle until I saw the ones from Ramon Monegal. It all started there for me. Do you display the bottle so you can see it ? What about the fragrance then as it catches light ? Difficult choice 😉 24 Faubourg sounds great, Maurice Roucel is one of my favorite perfumers but I am not really familiar with this creation. I do display it. I have a little mirrored tray on my hall cabinet that currently holds 24 Faubourg, L’Ambre des Merveilles and Jour d’Hermès. It looks gorgeous. I don’t worry about the light exposure, since I actually use these perfumes daily now (also there is almost no natural light in this room). In the cold blues of January I have already found myself reaching for orange blossom perfumes to inject a little sunshine. I remember testing this ages ago but it didn’t call to me – it might be time for a revisit, sun-drenched sounds good right now. In this world there are the things we need to survive but once you have that covered it is time to feed your soul – and beauty certainly does that. Perfume and beautiful perfume bottles are definitely good for the soul. Feeding the soul – that is surely what beauty does and like with food for the body, wanting the best for your soul can never be a bad thing (as long as we don’t confuse surface with substance). That bottle really is beautiful and the scent is so sunny that it can lift up moods on dark winter days. Enjoy your purchase. Thank you, Lukas! It is uplifting indeed. It’s even more great you got 20% off the price. I bought a decant of Oud Ispahan last week, it should arrive by the end of January. Looking forward to smell it. And yesterday I got a sample of new Atelier Cologne perfume, Mistral Patchouli. Aaand… I finally tried L’Ambre des Merveilles. Great things to look forward to! What did you think of L’Ambre? I really liked the scent. Will post a review later this week. Great. Hope to see a comment what you think about my attitude towards it. Birgit – I’m so glad your purchase of 24 Faubourg worked out!! Actually, maybe mine did as well…now I can go out and purchase that beautiful bottle… it really is a piece of art work. Enjoy. There are several limited editions currently available (this year, in addition to the one Birgit bought, there is a special “lock” bottle holder for pure perfume. Also, if you run a search on Amazon, you’ll find a couple of interesting offerings. I’ve seen several older ones on ebay, very tempting indeed. The lock is great, I’ve seen it at the Hermès store, it is available for all extraits in either gold or silver. So beautiful! Beauty for beauty’s sake. I believe we need it; it feeds and nourishes our often frayed nerves. A few years back I had a small notebook that I always carried with me, where I put down random sights of beauty. And sometimes, on particularly gloomy days (of which there were many, I was living in England at the time), I actually set out on “Looking for Beauty expeditions”. By the way there is a book by Alain de Botton that I can recommend, called The Architecture of Happiness, in which he analyses the importance of beauty. Apparently he was staying in yet another awful, soulless hotel room, when he started thinking about how the quality of our surroundings effect our wellbeing. Apologies for the ramble… let me just say that I love that you display the bottles you are currently using; it’s a great idea, and one I will definitely copy, for isn’t it a shame to hide such beauty? I will take a look at this book, thank you for the recommendation. I like NVC and Vero Profumo’s bottles very much too! “Shameless Beauty”, what a perfect title for a wonderful post. I’m so glad perfume has helped you to confront your guilt around indulging in beauty for its own sake. Life can be so dreary we positively have to seek it out, high and low, for our own well-being (I do anyway!). Your bottle is beautiful, enjoy it! A very good way to think about it, Tara! I need to try this one. It’s getting lots of love lately from everyone. I haven’t fallen for any Hermès scents yet, perhaps this will be the one for me. That is a great bottle too. Maybe it will be your scent. It is very different from Ellena’s Hermès. My mother likes this perfume. I bought her a bottle for Christmas last year and she still has it. My friend says it reminds him of a strict old French school ma’am! I find it quite gentle and classic. My mother is a fan, and I suppose, I am rather too. An old fave! Love it! Great review! Thank you! I’m really enjoying your blog. Wonderful reviews! Thank you very much, Nina, that is lovely to hear! I totally get your need and want for beauty and aesthetics!!!! In fact, it is up there with love, because what is love but deep and profound beauty? I want to be surrounded by it, as much as possible, be it in my home, my clothes, shoes, perfume. Beauty is definitely subjective, but I think it is important!!!!!!!! It is surely important. It is great that you incorporate the search for beauty in every aspect if your life. Am fascinated reading both yours and your readers’ thoughts on allowing oneself to appreciate and to own beautiful things. Because we take so many things for granted in the US, I’m not sure we actually fully appreciate the beautiful things we have, which is kind of sad. Cultivating a sense of gratitude … I think that’s essential to living a life that one could say is filled with beauty, and the comments here today really make me aware of that. Gratitude is such an important part of living well. I’m always reminding myself to try and be more grateful for all the good things I have (this applies especially to my boys when they are driving me up the walls!!!). 24 Faubourg suits you like a glove imho. When 24 Faubourg was first released there was still a wonderful perfume shop in Key West. The owner set aside a bottle for me, and I enjoyed it immensely. The love of beauty is something I understand. When I was a young pianist I fell madly in love with Bach Inventions, played them every day, evidently driving my mother crazy. One day she asked me “Why don’t you play things that people want to hear?” It was then that I understood that we had totally different ideas of beauty. Fortunately, she did like good fragrances, but never learned to appreciate Bach. of the scents from Hermes, the watery ones with no depth. Now I want another bottle of “24”. I’ve always had a hunger for beatiful things for as long as I can remember, and I don’t think that hunger is a purely superficial thing. There’s a very sad childrens story by the swedish author Astrid Lingren (“Is my linden-tree playing, is my nightinggale singing”) about a orhaned girl living in a poor-house who in the end prefers dying than living a life totally devoid of joy and beauty. An existence completely without beauty would be bleak indeed. What is the name of the Lindgren story? I’d like to read it. Thank you for your comment, Eva! Love this one! Would like to have a little someday. Have you tried the extrait? Or even just comment on the differences between the EDT and EDP? I’ve seen a few on ebay. I am at the boutique next week, will definitely try it then. This bottle is just incredible! I may have to revisit this the next time I am out shopping. Thanks for reminding me of this lovely fragrance that I wore when it first came out. I was friends with a SA at Saks that gave me a little gold compact of the solid perfume when I made my purchase. I believe I wore the EDT, is this bottle the EDP and which do you prefer? The compacts look very pretty too, great you have one! The Quadrige bottle is EdP, I’ll compare to EdT soon. 24F is a recent discovery of mine and is almost becoming a signature scent. I’m schooling myself to SAVE UP for a bottle not impulse buy! (New Year’s resolution 🙂 ) I agree it is symphonic but not the way Joy and First strike me as symphonic. In an odd way I admire 24F’s austerity, even with that ton of ingredients. Two observations: there is a texture in there that is slightly rough, like linen or raw silk. And secondly, 24F is not especially sweet; that’s what I like about it. Warmth without sweetness. It’s almost as if Roucel deliberately left a hole where the sweet bits would be. Sometimes I Imagine I’m watching him in the lab as he finishes work on the fragrance. He tweaks the last of the mods, sniffs, and nods with satisfaction. No sugar, no plumpy vanilla, no gourmand notes? Nope. He packs his materials away, winks at me, snaps off the light and ambles off down the corridor chuckling to himself. Job done. When I wear 24F I can still hear that dry chuckle! And congratulations on your shamelessly beautiful purchase. That is a perfume to display, wear and enjoy! Fantastic observations – and what a great image! Thanks Annina – it keeps me amused! I should add that although 24F has vanilla listed as a note, I don’t perceive it strongly, if at all. It probably contributes to the companionable effect that you note below. Without it, the 24F lady might be a chilly customer indeed! Yes, the Quadrige edition would be a great celebration of how I feel about this perfume but I’m not sure if it is available here, so the problem may solve itself. Which is fine – the standard bottle is beautiful too. That’s true. Let me know when you get one (and which one!)! That bottle is amazing! I also happened to check out previous limited editions of 24F bottles, and they are all works of art. I had to retest this today, after reading this. I had tested it long ago, and it just wasn’t me. But am I ever glad I spritzed today! What a warm, dignified, totally powerful feminine creature this is! I am utterly surprised to find myself considering a fb at this point! I’m under the weather, laying in layers of blankets. 24F is a very nice companion indeed. Another reminder to retest those perfumes that may not agree with me at first blush! Glad you are enjoying 24FB as well, Nina! Very passionate review! I love it! I have to admit that I haven’t tried it but after this, I think it will be next sampling! Thank you very much, Juraj! I’m glad you feel inspired to try 24FB. Let me know your impression once you’ve sampled it! Ah! I was wondering what else you got at that nice discount 🙂 Good choice! The bottle is beautiful, and there is no shame in my opinion for indulging in beauty. Analogously, my parents are messy. Very, very cluttered. Just piles of things everywhere. It drove me nuts as a kid and as a result, I grew up to be very, very, very organized. But it does often work like that: my mother has never in her life worn make-up, I was (and still am) obsessed with it since I was six years old (not using it since then though obviously 😉 ). I’ll try this perfume tonight: I did it once at a store, liked it, got a sample – but then never tried it again. I will. I want to join others in saying how great it is that you’ve overcome your upbringing. But I also want to mention that now you have a great opportunity: to raise both of your sons with the guilt-free love and appreciation of beauty – won’t it be wonderful? I hope I can instill that appreciation in them. Did you like 24 FB then? I’m back to report: nope, not my cup of tea. It’s not bad, I could probably wear it but I know that if I had it in my collection I’d probably skip it every time I choose what to wear for another perfume. One of perfect florientals to me. I still have a sample from nineties. It fits me best from all the Hermes creations I know so far. Ellena’s are to light for me. I like them but would buy them only if I had plenty of money. Glad you appreciate it as well, Civava! When I first read this review I didn’t comment because I thought there is no way this perfume is for me.Today I was in the grocery store and this woman walked by me trailing a moderately soft but incredibly beautiful sillage. I followed her all the way through the produce department (basically the length of the store) until I caught up with her and asked what her fragrance was. Her answer was Hermes 24 Faubourg. Now why have I never tried this one? Sometimes I think I need to smell a fragrance on another person before I can come to appreciate it. Unfortunately, I now want to try this perfume on my skin. And of course, if it works with my chemistry I’m going to want the same beautiful bottle that you have. Oh I love that! Encountering a perfume in the wild is always great and especially when you feel so compeled that you have to follow and find find out about it. I’m glad you like 24 Faubourg and I hope you like it just as much on your own skin.